eCourse "How to Start Your Own Balloon Decorating Business - 7 Easy Lessons to Success"
To become a balloon artist or decorator, you first need to have an interest or even a passion for working with balloons. Secondly, you should do an honest self evaluation if you have what it takes to turn this passion into a profession (discipline, determination, willingness to work on weekends, etc.). Ticked off both boxes? Great! Then let's move on to market research, legal & tax obligations, marketing strategies, what tools & materials you need, etc. Sounds too difficult? 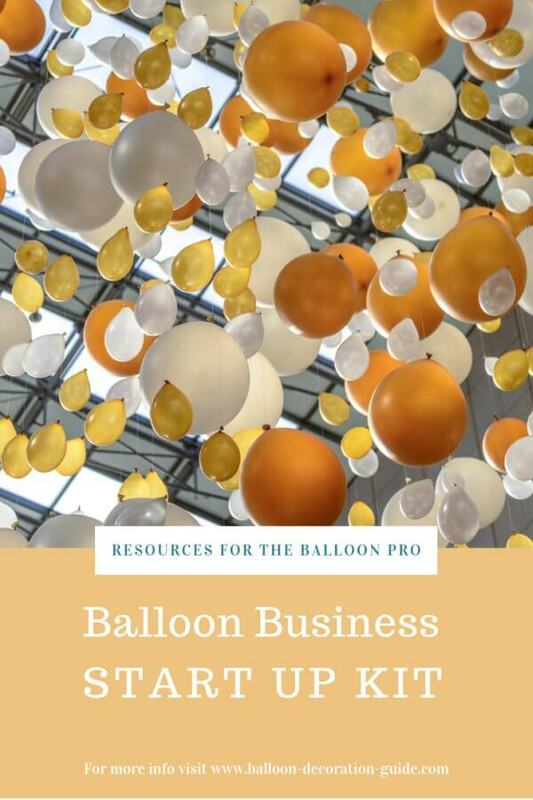 With the right mentor, it really is easy to cover these important balloon business start up facts. My eCourse "How to Start Your Own Balloon Decorating Business" starts with a self-evaluation and then guides you through every step of the startup process. The video creator, Amazing Balloon Guy, has a good YouTube channel with balloon tutorials. Towards the end of the video he offers that you can use his photos for your portfolio (you have to contact him via email to get the photos). Nice gesture! Now that you've taken care of the - admittedly not so exciting - business side of things, you want to delve into the actual doing of balloon decorations. 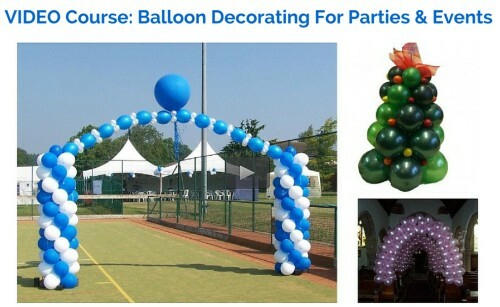 Many of the common designs you can do with the instructions and tips on balloon-decoration-guide.com. But you might still be looking for more training and step-by-step guides. The two big players in the balloon business - Qualatex and Conwin – both offer a series of instructional DVDs. I have no personal experience with any of their kits. Considering the reputation of the publishers, it's safe to assume that they are of high quality. 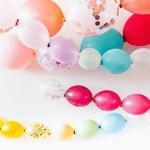 links to the latest trends, tips and products of balloon decor experts. Unfortunately there are no more distributors in the USA. You can still get it from some companies in Europe. Each kit includes a DVD, the Qualatex catalog, online reference material and test. With the first kit, you also get the "Design Basics With Balloons" book. If you go through all three training units and take the tests, you can display the "Certified Balloon Artist" (CBA) logo on your web site or marketing brochures. Price (as of February 2017): US$ 99 per kit, or US$ 249 for all three of them. If you're just starting out with balloon decorating, you may find the online course "Easy to Learn Basic Balloon Decorating for Parties & Events" helpful. The course includes 23 lectures with a total of 2.5 hours of video. In the first lessons, you'll learn the basics, for example how to correctly fill and tie balloons, how to knot them into pairs and create clusters of 4 balloons. The lessons are broken down into short easy to follow videos. Over 700 students are enrolled in the course (at the time of this writing, March 2019), and it has an overall rating of 4 stars out of 5. 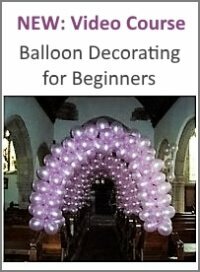 "This balloon decor course is designed for beginners who wish to learn how to create balloon displays for parties and events for themselves without having to hire a professional. No prior knowledge is required. Everything will be explained to you and demonstrated step by step." Ebay offers a selection of balloon decorating DVDs. Sometimes you'll also find the Conwin Master Series for sale there. Browse the selection below for anything of interest to you. 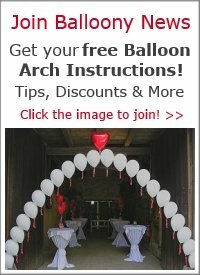 Finally, check out the events calendar at BalloonHQ.com to find balloon decorating classes in your area. Best of luck with your balloon business start! Please let me know about your experiences in the comments section below. 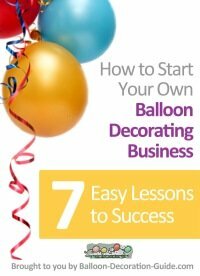 eCourse "How to Start Your Own Balloon Decorating Business" - Get Started Now! Need more clients? Check out my complete Social Media and Marketing Services for your balloon business!